Five years after the Rana Plaza building collapse, UFCW Canada is calling on members, activists, and allies to tell Walmart to sign an accord that will protect the health and safety of Bangladeshi garment factory workers. Bangladesh is a major source of apparel sold at Walmart. On April 24, 2013, the Rana Plaza building came crashing down on Bangladeshi garment workers labouring in the factory, killing 1,134 employees and injuring hundreds more. Facing global public outcry in the wake of the tragedy, many companies in the garment industry – including retailers like Loblaws – committed to making Bangladesh factories safer and respecting workers’ rights. 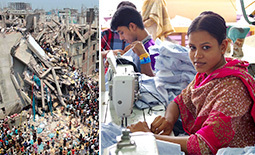 For example, over 220 apparel brands and retailers, including Loblaw’s Joe Fresh, signed the legally-binding Bangladesh Accord on Fire and Building Safety, which requires companies sourcing from Bangladesh to take responsibility for garment workers’ health, safety, and wellbeing. But Walmart refused to sign the Accord. The Accord has saved lives and has dramatically improved factory safety in Bangladesh. But it is set to expire in May 2018, and workers still face barriers to forming unions to bargain for them and be their voice on health and safety. As a result, a new agreement – dubbed the 2018 Transition Accord – has been created and will take over the current Accord to ensure that work continues to improve factory safety in Bangladesh. The 2018 Transition Accord also recognizes the importance of Freedom of Association and the right to join a union in protecting workers’ health and safety. So far, 144 global brands have signed the new 2018 Accord, covering more than 1,300 factories and approximately two million workers. But Walmart has yet to sign the agreement, despite continuing to do business in Bangladesh. UFCW Canada is therefore calling on members and allies to show their support for safe factories and workers’ rights in Bangladesh by sending a message to Walmart urging the company to sign the 2018 Transition Accord. You can make a difference by sending a message below!